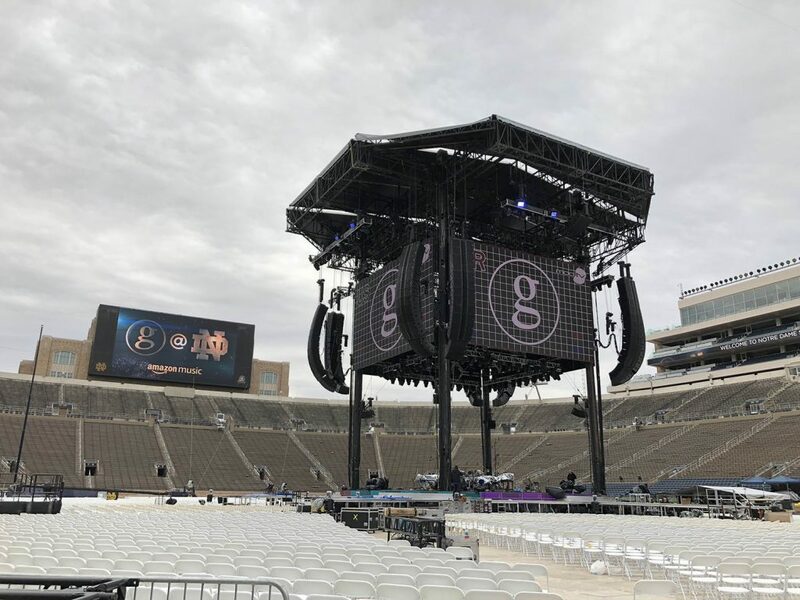 Country legend Garth Brooks gets honor of first concert ever at historic Notre Dame Stadium and battles weather to delight 84,000 fans. Garth Brooks has rewritten a lot of music history since he exploded on to the country scene in the late 1980s. Thirty years later, he’s still making history in new ways every day. 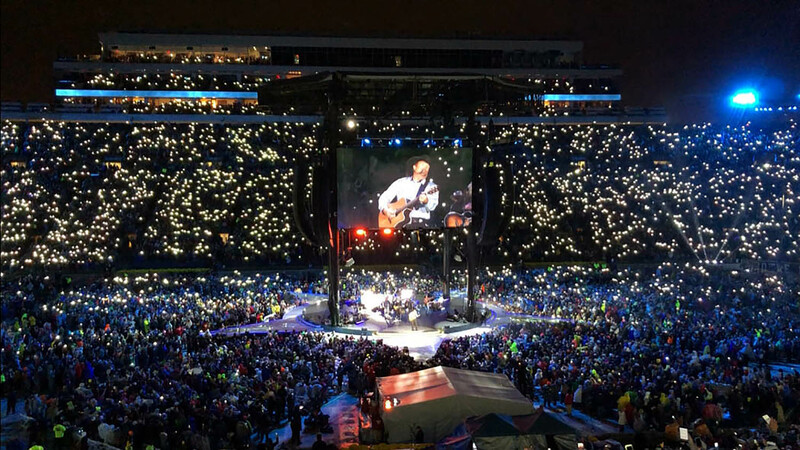 The moment the country legend made his appearance in front of 84,000 fans at the sold-out, first-ever Garth Brooks concert – and first ever concert at all – at Notre Dame Stadium, there was no doubt something historic was in the air—and we’re not just talking about a whole lot of cold rain, wind and even a little snow. In fact, the high winds were strong enough that the production team had to coordinate with local and university meteorologists to evaluate and maintain the safety of the staging. “By four o’clock in the afternoon, just hours before the show, we still didn’t know if the Garth Brooks concert would go on,” said Dan Heins, FOH engineer for Brooks since his breakthrough success in 1989. 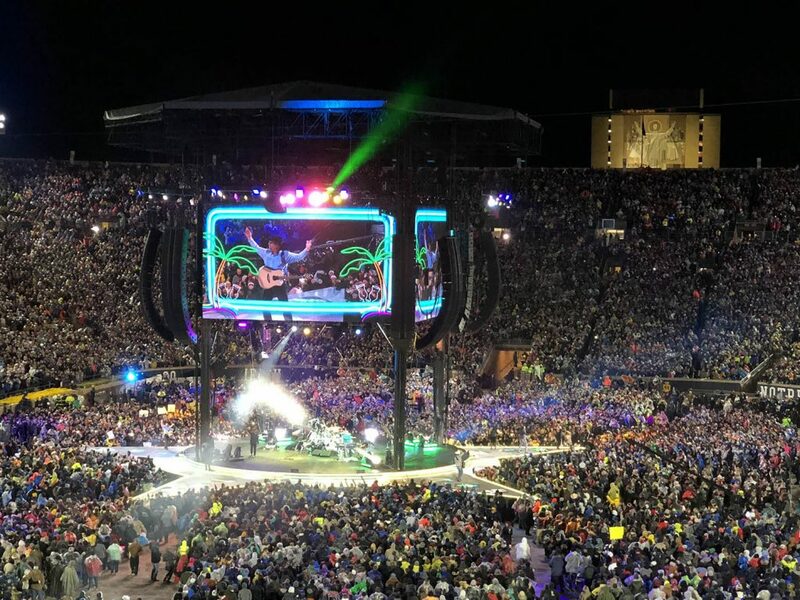 And, though the show was delayed by an hour, nobody cared once the sound of Brooks’ latest hit, “All Day Long,” radiating gloriously through Brooks’ exclusively designed Clair Brothers PA, sparked energy throughout the recently renovated Notre Dame Stadium. Thunderous applause amid tens of thousands of unadulterated screams more than answered his question. Part of the show’s magic was the star-shaped stage with a 360-degree rotating center stage on which Brooks and his band performed – a theater-in-the-round concept where Brooks moves freestyle around the periphery playing to each side of the stadium. While playing one of his greatest hits, “The River,” the audience sang along with the chorus, setting an entrancing mood throughout the Notre Dame Stadium. Cameras rolled as the multitude’s massive singular voice was recorded – a recording that was mixed in as part of the TV special, Garth: Live at Notre Dame! Brooks recently announced his plans for a three-year stadium tour starting in early 2019. The confidence he has in playing such huge venues is born from his record-breaking, recently completed three-year arena tour that sold over 6.3 million tickets, often in multi-night, multi-show runs per city. The plans for the stadium tour sound system are simply augmentations and adaptations from the successful sound design from the arena tour. The fundamental core of the stadium rig is the Clair Brothers i218 line array system that has been increased in size to cover stadiums in-the-round. The Garth Brooks concert used a total of 96 i218 array cabinets and 48 i212 cabinets in the main array hangs, all eight hangs with identical equipment. The layout for the stadium utilized two different array hang configurations, depending on whether the array was facing the sideline or the end zone.